Addressing Professional Liability Claims is an authoritative, insider's perspective on the ins and outs of one of the most complex – and costly – legal issues for professionals. 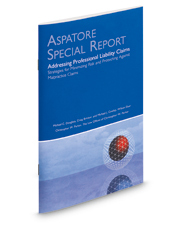 This special report is a guide for professional liability attorneys and clients in all industries to help stop a liability or malpractice suit before it starts. Professional liability attorneys will learn tips for how best to advise their clients, develop effective defense strategies, and decide whether to bring a fee suit. Their clients will gain insight into preventative measures for avoiding claims and developing a successful and trustworthy relationship with counsel. These experts help readers understand and implement the practices that separate successful professional-client relationships from the rest.